Oh, dear. A reader tipped us to this "Fruit Infusion Pitcher," an innocent gift being offered via the Signals catalog that's meant to provide the user with a naturally delicious cup of homemade tea. The design is...interesting, no? Fruit-infused water and teas are all the rage-tasty, refreshing, and good for you. Make them at home and you'll find that you drink fewer costly (and sugary) sodas and other flavored beverages. Crystal-clear acrylic pitcher has a removable infusion rod that screws into the lid; open slots in the rod allow the fruit and water or tea to mix naturally. Refill the pitcher without replacing the fruit. Sleek and attractive, it goes from fridge to table. Holds 2 ½ quarts. Hand wash. 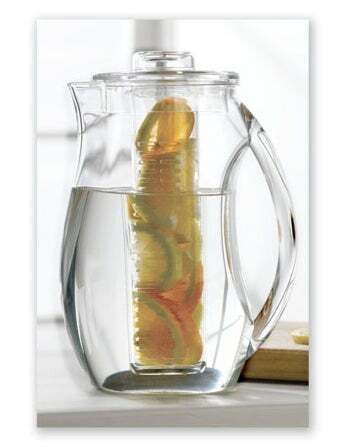 Signals isn't the only place where the pitcher is being sold; Amazon and Cooking.com are also offering similar pitchers, though they chose to run pictures showing the pitcher with a different (and sadly, not as funny) arrangement of fruits within the pitcher's inner rod. In the end, the pitcher itself isn't scandalous; it's just the way Signals chose to arrange the bits within that makes it seem as such. I suppose it was just an innocent little pitcher the entire time, until dirty minds like ours got a hold of it. Whoops! On the other hand, how can you not see it?! HOW?!?! I mean, come on, Signals. Could it be any more obvious?